Cwm Irfon Lodge Holiday Cottages01591 610 849work Self-cateringFour individual cottages in three acres of gardens and mixed woodlands. Each of our cottages are light and airy with south facing stone terraces and wondeful views down the Irfon Valley. Here you can sit and watch the Red Kites, Buzzards and Hawks patrolling the skies. 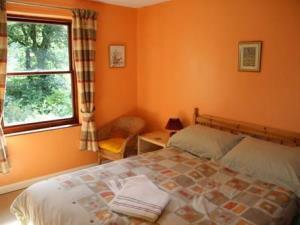 The cottages are warm and well equipped and our prices include heating, lighting, bed linen and towels. There is a separate utility and laundry room with a tumble dryer and washing machines. There is also a sauna available to guests on an hourly or sessional basis. Just below Cwm Irfon is the river Irfon after which it is named. The use of the cottages includes discounted access to fishing in the River Irfon. Four individual cottages in three acres of gardens and mixed woodlands. Each of our cottages are light and airy with south facing stone terraces and wondeful views down the Irfon Valley. Here you can sit and watch the Red Kites, Buzzards and Hawks patrolling the skies. The cottages are warm and well equipped and our prices include heating, lighting, bed linen and towels. There is a separate utility and laundry room with a tumble dryer and washing machines. There is also a sauna available to guests on an hourly or sessional basis. Our nearest town is Llanwrtyd Wells, it is three miles down the valley along the River Irfon. Here there are a diverse range of facilities including restaurants, real pubs, an excellent Tourist Information Centre and shops providing all of the basic necessities. Log fire only available in Woodpecker Cottage Children welcome from any age. By Road: From Llanwrtyd Wells on A483 between Builth Wells and Llandovery take small road towards Abergwesyn for 3 miles. Cwmirfon Lodge is on left hand side by a blue sign with a woodpecker on it. You can travel to LLanwrtyd Wells by train on the Heart of Wales Line which leaves from Swanse in the South or Shrewsbury in the North. Let us know and we can pick you up from the station which is 3 miles away. Access Statement Cwm Irfon Lodge Holiday Cottages Cwm Irfon Lodge Cottages are set in the Irfon Valley about three miles from Llanwrtyd Wells. The grounds slope steeply in some places but all four cottages can be accessed via one small step at the entrance. Access to the cottage terraces is only possible using two or three steps. There is some level lawn and flower beds although most of the gardens and grounds slope steeply All accommodation with the exception of Nuthatch Cottage is ground floor. Nuthatch Cottage has one step into the cottage and one step separating the sitting/dining room. There is a twin bedroom and a bathroom on the first floor. Bathrooms have a bath with shower attachment. Nuthatch Cottage also has one walk in shower with one step (threshold) Lighting is good within all of the cottages and particularly good in Woodpecker Cottage, which is also open plan. All dogs with good owners including assistance dogs welcome. Staff trained in disability awareness Cars can be driven to within 10 metres of Kite and Nuthatch cottages There is no mobile phone cover although Buzzard, Kite and Nuthatch Cottages have payphones. Wheelchair loan is available locally on request Good colour contrasts to floor, walls and doorways. We welcome the opportunity to cater for individual needs.